Dazie Delights: Little musings - Birthday Boutique- look inside! Evening all, thank goodness blogger is back I had serious worries that I may never see my blog again! Anyway I have a little musings to show you and I must admit I love it! 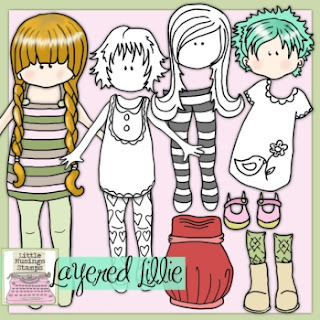 The set is called Layered Lillie and she comes pre coloured or in black and white for you to work your magic. The set is just £1.50 and is available to download HERE. For this make I wanted to do a birthday card / Gift all in one so I made my lilli a boutique within the card and here are the pics! The inside, all the hair outfits and shoes and Lillie herself. And then finally the back fold of the card I have popped a pocket with a tag in so that a message can be written. I love it and these pics really dont do it justice! So if you want to get your hands on the set to make your own fabby make with Lilli then check out the digi store just click on the pic to take you there! Gorgeous card Lisa - love the colours in this one, very pretty and girly!!! The inside and back look great as well and I know that most little girls would be made up to receive this!